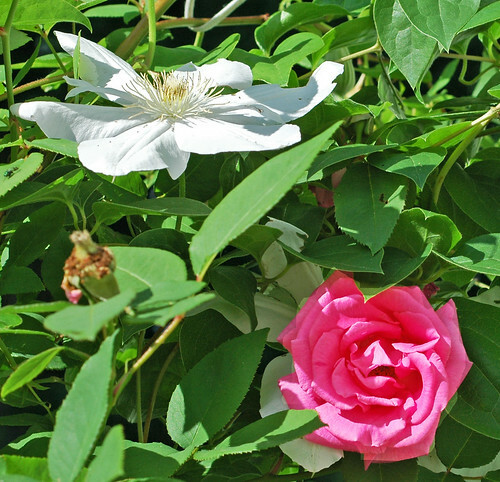 rose and clematis, originally uploaded by jahansell. Last year, the first one of this blog, I posted lots of flowers, showing the passing of the seasons. This year I haven't, as much (I missed the tulips, and the peonies are all but gone), but the roses and clematis growing up my front door beg to be shown off. Most of my flowers don't seem to want to bloom this year, perhaps because I moved them all last fall. No lilacs, only one peony, and no iris, yet anyway. But the roses are happy - they got to stay put! By the way, i think I over photoshopped this one - it was very sunny, and thus very contrasty, and I tried to lift the shadows in the rose and bring down the blown-out highlights in the clematis. It looks pretty fake now! It's a beautiful shot of the two flowers. Do have a look at my 'Delonix Regia'. Finally, I've posted a flower whose name I'm sure of. I know nothing of the technical stuff...I just love the flowers! Very nice photograph. The contrasts in color are nice to see. thanks for answering the roses' call to be shown to the world. very nice roses u have in your garden!